In 1988, author Rohase Piercy did something remarkable and controversial. Boy, did some people find that idea challenging. The Daily Mail seemed to think it would cause the fall of England, though the Guardian responded with bemused good humour. Many readers who had thought about the queer possibilities of this literary partnership were delighted. A preface by Dr Watson is followed by part one, ‘A Discreet Investigation’, in which a case leads Holmes and Watson to the demi monde, a tangled case of blackmail and the question of whether Sherlock Holmes has noticed that his client and her intimate friend are in fact a lesbian couple. Told canonically from Watson’s point of view, Watson’s unrequited love for Holmes and attempts to deal with his unrequited affections become central. Does Holmes know of Watson’s dangerous leanings, or to whom they are directed? Will Watson’s ‘indiscretions’, the way in which he tries to manage his hopeless desire, destroy their friendship? Or will Watson find a way to live with his nature while protecting both himself and Sherlock Holmes’s reputation? Watson’s resolution to this crisis with Mary Morstan (who has secrets of her own) isn’t the end of the matter, however. The second half of My Dearest Holmes, ‘The Final Problem’, deals with the aftermath of Watson’s solution, as well as the events at the Reichenbach Falls and ‘The Adventure of The Empty House’. It’s a far cry from the stories Watson wrote for The Strand, which are necessarily inaccurate to protect their original clients as well as Watson’s deeply troubled heart. 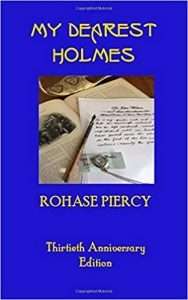 2018 marks 30 years since My Dearest Holmes caused such consternation, and so Rohase Piercy has published an anniversary edition. The new edition is framed with a foreword by Charlie Raven, exploring the changes in attitude to LGBTQ relationships in the intervening 30 years, and a final essay by Piercy – “Sherlock Holmes: a Decadent Detective?” – on the gothic and decadent origins of the character. 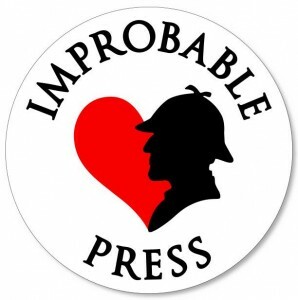 This reprint of My Dearest Holmes comes into a world where queer readings of Holmes and Watson are not so rare – Improbable Press even specialises in Holmes♥Watson fiction! How does it stand up, 30 years later? Reader, it is wonderful. An angst-fest for sure, but splendidly paced, and full of teasing moments. Some canon-esque humour gets in there, and some entertaining reworkings of the stories we know, shifted to become the history of “what really happened” in this telling. Holmes is as ineffable as ever, often fond of his friend, sometimes unkind, and a stickler for not getting sentimental about things. Along with John Watson, you can’t tell how Sherlock really feels about his friend. What, if anything, does he feel, and what might he be repressing? How much does his use of the cocaine bottle relate to everything he never says? Watson’s inner turmoil is compassionately explored, as is the world under the surface of respectable London, with loves and liaisons not accepted by the mainstream but definitely humming away in the shadows. There are cases of course (where Holmes is, there too are puzzles) but the true, unexpressed feelings between these two great friends and colleagues is the largest puzzle of all, and it’s only resolved in the last few chapters. Piercy’s writing, like the best new Holmesian adventures, mimics the tone of Conan Doyle without becoming clumsy or cliched. My Dearest Holmes has a style reminiscent of Doyle and is easy to read in that regard. Which is great, because I gulped it all down. There’s a lot of hurt before we get any comfort at all, but it’s well told and not without lighter, warmer moments. And while subtle in its execution, the payoff is worth the wait.